Creation of Sundarban Biosphere in 1989 ushered in a new era of conservation of bio-diversity in the inter-tidal zone of Sundarbans. This Reserve comprises an area of 9630km bounded by the 'Dampier-Hodges Line on the North Bay of Bengal on the South, Ichhamati-Kalindi-Raimongal on the East of the River Hooghly on the West. Including 4264 km of mangrove forests, which account for more than 60% of India's total mangrove forests. The balance area of the Biosphere Reserve (5367 km) comprises lands outside the forests, but within the Intertidal zone. Population of over 2.5 million is spread over 1060 villages and 3 towns (Taki, Joynagar and Canning) under 6 blocks of N. 24 Pgns. Dist and 13 blocks of S. 24 Pgns Dist, 44% of whom belong to the Scheduled Castes and Scheduled Tribes as against 25.61% in the state. About 85% of the populations as against 57% of the state are agricultural workers and about 50% of the cultivators is landless. The inaccessibility is a serious constraint forded the region. i) Identification and demarcation of the unique eco-system and its role for international network in global eco-system and its role for international network in global eco-system conservation. ii) Ecologically compatable economic development (Eco-development) of the intertidal zone. iii) Research, training monitoring etc. The development of fishery, particularly prawn-culture, apiary, oyester-culure, mushroom-culture, pearl-culture, apart from providing basic needs of life, i.e. improvement of communication through water, removing illiteracy, providing drinking water have been aimed at. Apart form this, massive afforestation programme was included both inside and outside the forest. i) Establishment of Sundarban Biosphere Reserve. 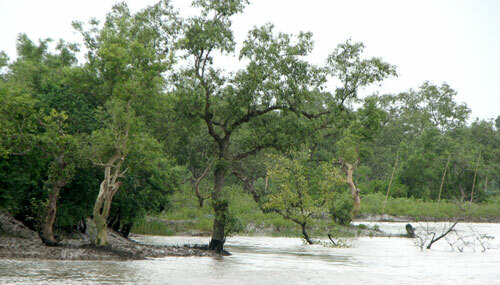 ii) Conservation and Management of Sundarban mangroves. iii) Intergrated Afforestation and Eco-Development Project. B. Area Oriented Fuelwood and Fodder Programme (50% Centrally Sponsored Scheme) Establishment of Sundarbans Biosphere Reserve Performance during 1998-99. Advance work for 1999 Plantation	 255 ha 8.70 "
Fuel wood & Fodder spp. Adv. Work	 30 ha 0.82 "
Soil Conservation 134 km. 4.00 "
Social Welfare activities 6.00 "
Education, Training & awareness	 0.60 "
Addl. Income Generation Scheme	 217 nos. 2.23 "
Horticulture activities	 20,000 nos 2.30 "
Printing of leaflets, posters etc. 1.00 "
Educational Training & Awareness 1.00 "